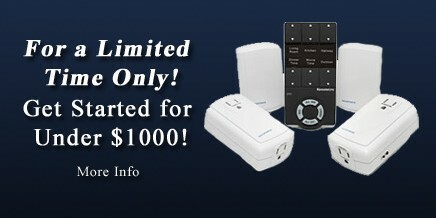 HomeBlogSpecial: Get Started with Home Automation for under $1000! For a Limited Time Only! Have you ever wanted to explore home automation? Would you like to try the convenience and fun of having a smart home without spending tens of thousands of dollars? Call Duprey Home Automation today. We’re offering a great way to get started with home automation at a low price. Duprey Home Automation will lay the foundation for your new smart home and will install the necessary infrastructure to allow you to control all the Lights, Appliances, Audio/Video, Security Cameras, HVAC, Sprinklers and any other electronic device in your home. We hand selected the components in this starter package to give you an excellent representation of just some of the things you can do in your home. For starters, the kit allows you to control 6 lights & appliances at installation and gives you four different ways to control everything. It is completely expandable in the future and will grow seamlessly with you. The package includes several units that can be placed throughout the home where it is most convenient. Control Everything in your home! – 1 attractive remote control to control everything from anywhere in the house! Several options are available to expand the system, including devices to allow control and automation of the more powerful 220v devices in your home such as the hot water heater, pool heater and more. We can give you the ability to control your entire home including Lights, Appliances, HVAC, Sprinkler systems, Security Cameras, motion detectors, door and window sensors and more all from your mobile phone or laptop, anywhere in the world! We have the ability to let you control all the devices in your home remotely, or program them to run all on their own! No need to worry about turning on a porch light or closing the garage door every day, the house will take care of it all for you! Be Green and Save Green! Safety & Security- Keep your home and family safe! Automate the daily goings on in your home- put your home to work for you. Have the home notify you when things go wrong or alert you to a problem. Convenience and Enjoyment- Its Fun! Enjoy never having to run around the house turning things off. Push one button and the house runs itself! We can integrate motion detectors, door and window sensors and servailance cameras into your complete smart home. We then program them to alert you via audible response, email or text message if they detect any problems! Contact us today to let us show you what we can do for you and your home.